The usual recommendation is to learn using unused locks as badly made keys can jam or damage locks. The aim of the night will be to learn key cutting using the scissors method, working up to cutting a double sided emergency key for a car. 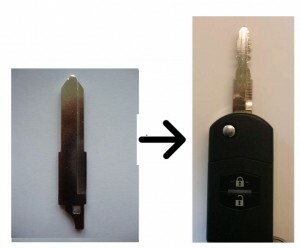 Extra bonus points for those who arrive with a pre-made key for my car made from the photo above! No need to book nor bring anything, just have a look at the 3 videos above and drop by on Tuesday May 7th at 7.30pm. This was written by zg3409. Posted on Thursday, May 2, 2013, at 1:59 pm. Filed under Lock Picking, Project. Tagged lockpicking. Bookmark the permalink. Follow comments here with the RSS feed. Post a comment or leave a trackback.